Today, we release the findings from our fifth annual content marketing survey — and it’s our biggest and best year yet. For this year’s survey, we decided to ask some new questions, and change how we approached some of our regular questions, in order to provide fresher, more insightful findings. 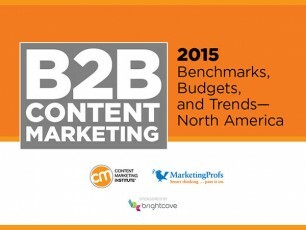 Thus, B2B Content Marketing 2015: Benchmarks, Budgets, and Trends — North America, produced by Content Marketing Institute and MarketingProfs and sponsored by Brightcove, reflects the progress our industry is making in exciting new ways. 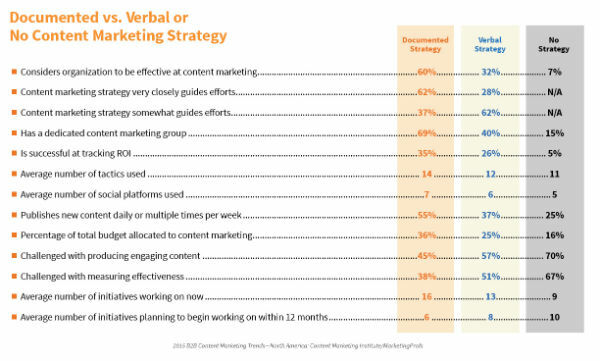 But despite the changes we’ve made on our survey, the key takeaway of our B2B content marketing research this year is something we’ve been continuously stressing at CMI for a while now: Marketers who take the time to document their content marketing strategy are more effective than those who don’t. This might sound similar to last year’s theme, and it is — but with one important difference: This year we found that a large percentage of marketers are operating under a “verbal strategy.” That’s a great starting point, but taking the time to document the strategy you’ve created is a critical next step. In last year’s survey, we asked for the first time whether marketers had a documented content marketing strategy. Forty-nine percent said “no,” which left us wondering whether a lot of those marketers did indeed have a strategy, but had just not documented it. Sure enough, we found that many do have a strategy (83 percent), but only 35 percent have documented it. Click to tweet: 83% of marketers have a #contentmarketing strategy, but only 35% have documented it. B2B marketers who have a documented strategy are more effective and less challenged with every aspect of content marketing when compared with their peers who only have a verbal strategy or no strategy at all. Of those who have a documented strategy, 60 percent consider their organization to be effective. In contrast, only 32 percent of those who have a verbal strategy say they are effective. To take it a step further, 62 percent of the most effective marketers also say they follow the strategy “very closely.” The lesson is clear: If you want to be more effective at content marketing, take the time to record your strategy and follow it closely. Want to learn how to document your content marketing strategy? Download The Essentials of a Documented Content Marketing Strategy: 36 Questions to Answer. 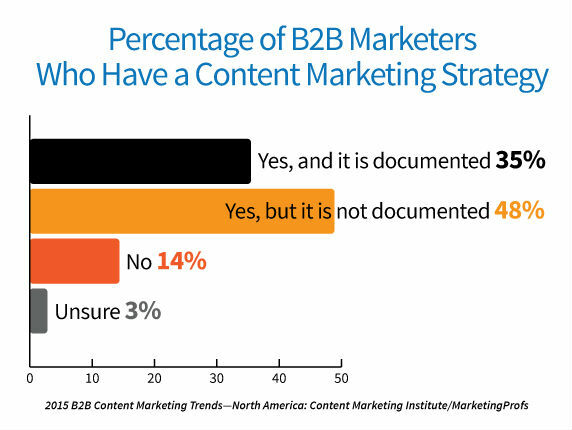 Click to tweet: 60% of B2B marketers with a documented #contentmarketing strategy say they are effective vs. 32% of those with a verbal strategy. In many cases, we found that content production continues to increase, no matter how effective organizations feel they are at content marketing — or whether or not they have a documented strategy. 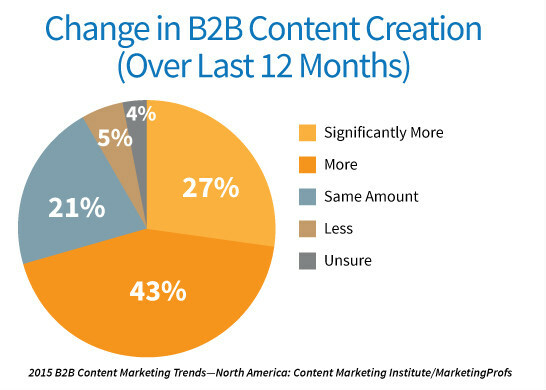 In fact, 70 percent say they are creating more content than they did one year ago. 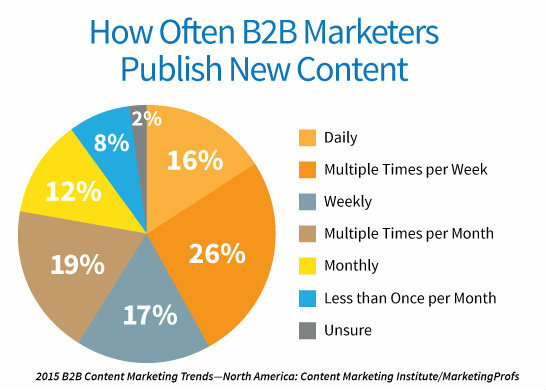 Click to tweet: 70% of B2B marketers are producing more #contentmarketing this year than last year. This year, we also asked, “How frequently do you publish new content?” Forty-two percent said daily or several times per week. 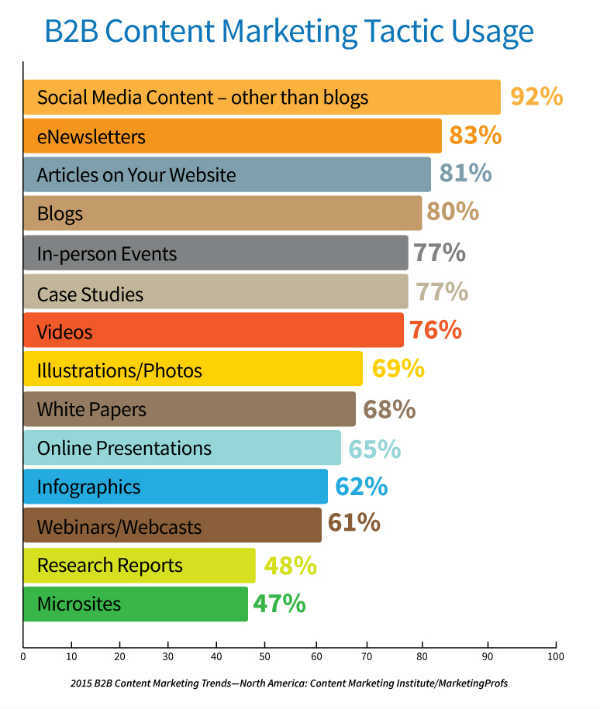 Of those who have a documented content marketing strategy, 23 percent said they publish new content daily. Measurement continues to be a hot topic among content marketers, so this year we asked how successful they are at tracking ROI on their content marketing programs. Only 21 percent said they are successful; however, the number goes up to 35 percent for marketers who have a documented strategy. Similarly, when looking at challenges, almost half of B2B marketers cited measuring content marketing effectiveness as a challenge — a number that has gone up from 33 percent last year. 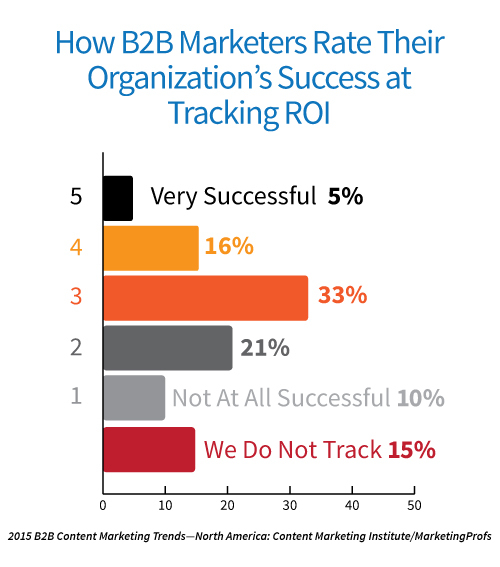 Click to tweet: Only 21% of#B2B marketers are successful at measuring content marketing ROI. B2B marketers use an average of 13 content marketing tactics — same as what was reported last year. Of these tactics, 92 percent cite social media content (other than blogs) as the most used, followed by eNewsletters (83 percent), and articles on their website (81 percent). Infographics as a tactic saw the biggest rise in usage (from 51 percent last year to 62 percent this year). Illustrations/photos was a new option this year. For the first time, we asked marketers which paid advertising methods they use to promote/distribute content — and of those, which they consider to be most effective. 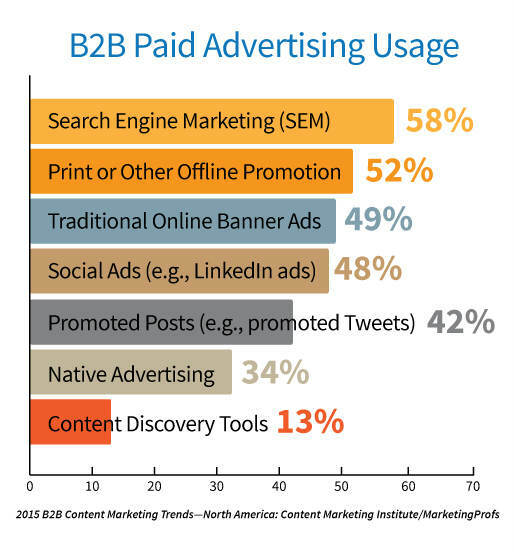 On average, B2B marketers are using three paid advertising methods, with 80 percent using at least one. Search engine marketing (SEM) tops the list as the most used (and most effective). While the adoption rates for the “newer” paid methods of native advertising and content discovery tools isn’t very high yet, 36 percent of those who use them say they are effective (giving them a higher confidence rating than marketers give for the more established paid methods of “print or other offline promotion” and “traditional online banner ads”). New for this year, we presented marketers with a list of 28 content marketing initiatives and asked them to indicate which ones they are “working on now,” “plan to begin working on in 12 months,” or are currently “not a priority.” Marketers reported that they are working on an average of 13 initiatives now — and are planning to begin work on an average of eight more initiatives. Sixty-nine percent of marketers said they are working on “creating more engaging content” now, and 36 percent will begin working on “measuring content ROI” within the next 12 months, making these two areas the most often cited in those two categories. Click to tweet: B2B marketers are working on an average of 13 #contentmarketing initiatives: 69% are working on creating more engaging content. Click to tweet: 36% of B2B marketers will begin working on measuring content ROI initiative within next 12 months. Note: If you would like to download the PDF, select Save via the SlideShare link. If you are interested in research, we have many more new findings coming your way, as well as explanations of the “whys” and the “what nexts.” Subscribe to our email so you don’t miss anything.